"Maler and his design team give the fairies' forest a bright, boppy feel; the nearly fluorescent palette of oranges and magentas guarantees that you will see it, even from the farthest hummock. They're all as shiny as the balloons that designer Beowulf Boritt clumps around his Astroturf set in place of trees." "On its grassy square of a stage with one corner held aloft by a large balloon moon, its Athenian wood a forest of colorful helium spheres bobbing on gossamer strings of trunks, this Dream shimmers. 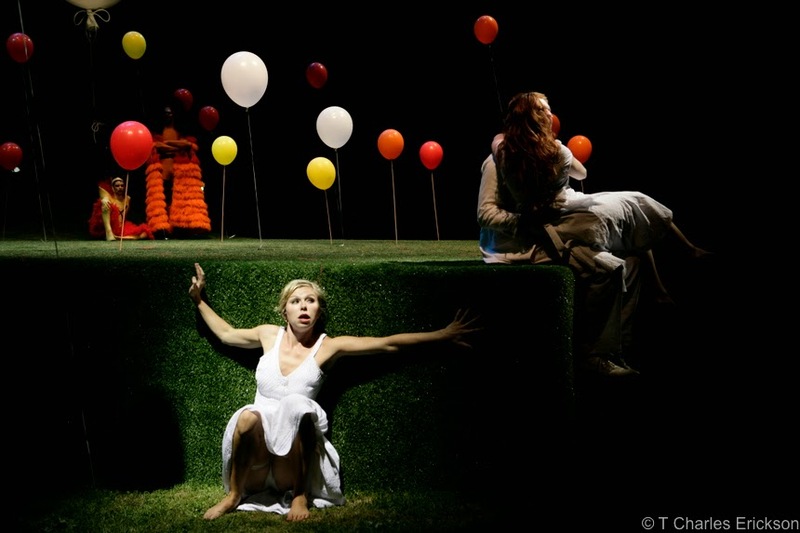 And set designer Beowulf Boritt's clever motif hangs in to the end: in the 'Pyramus and Thisby' travesty with which a troupe of proletarians salutes the wedding finale, the Moon's dog is a balloon animal and Thisby's breasts are not silicone implants."